Right on the coast of Spain, the MotoSurf WorldCup Championship has started the 2017 campaign. World Cup riders started the action in Greenwich Marine close Benidorm. The riders then moved to Villa Joiosa for next two days of jetsurf racing preparations. Over 30 jetsurfers in total from men and women category joined the action. Riders experienced a tough water conditions with big waves among the boeys on day one. Much more joy came on day two and three. Vila Joiosa provided a comfortable set-up for riding and racers could spent the whole day on a beutiful Spanish water surface. 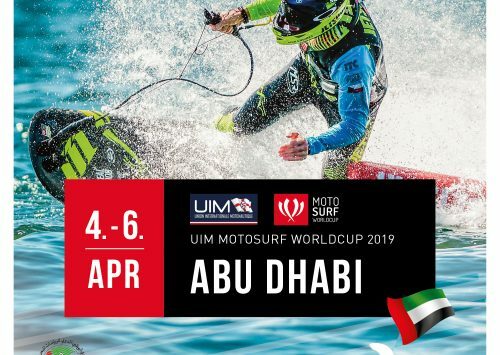 At the end of the all testing sessions, WorldCup jetsurfers also could enjoy posing for helicopter shooting ending the whole testing process. The MotoSurf WorldCup pre-season testing in Spain was the first official meeting of teams and riders in 2017. 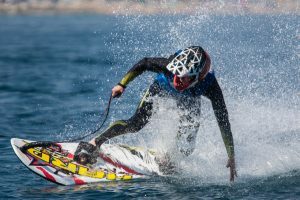 Jetsurf Factory Team was present in full strenght with Martin Šula, Jakub Kornfeil and a newcomer into the women class Elisabeta Faitová. 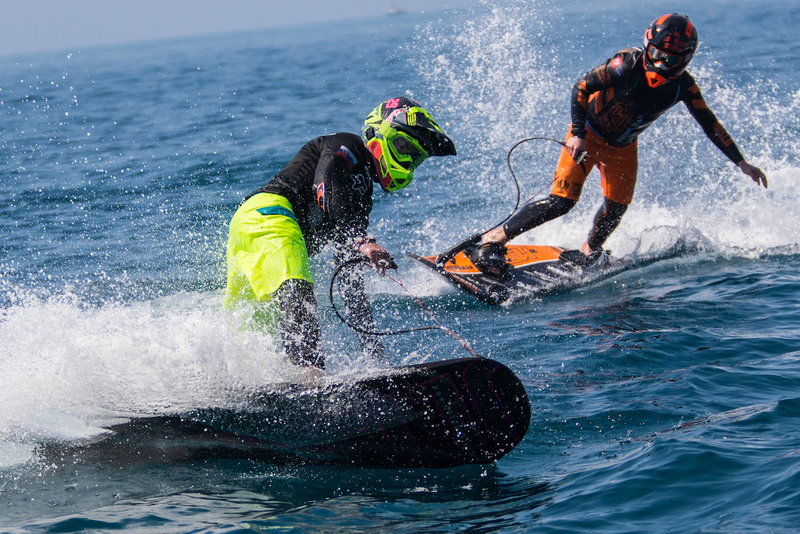 The second squad run by the Jetsurf factory is MSR Engines Team with two 2016 Champions Lukáš Záhorsky and Aneta Šacherová. The duo was missing their third team mate Michal Lošťák who will jump into racing right away in the first race of the Championship. Jetsurf Slovakia’s Sebastian Kubinec was working hard to build up on his 2016 great performances. Recently announced Jetsurf USA’s Ale Rivas from Mexico enters the 2017 with big expectations. Ale trained so hard and it will be interesting to see where she can be during the season. Many of the new teams joined the business at the testing. Symbio Jetsurf Team with Ivo Strouhal and Martina Bravencová looked in a great shape and there is no doubt they will be aiming high. So will be the Prague Jetsurf Club with two Jans – Charouz and Svoboda, Pavel Heiník and Martina Lukscheider. Hard Racing – a brand new squad from Brno brought all the three racers, Nicolas and Jiří Blaha and supermoto rider Jan Drkoš. They all seem to be adapting quite quickly to a WorldCup competition environment. 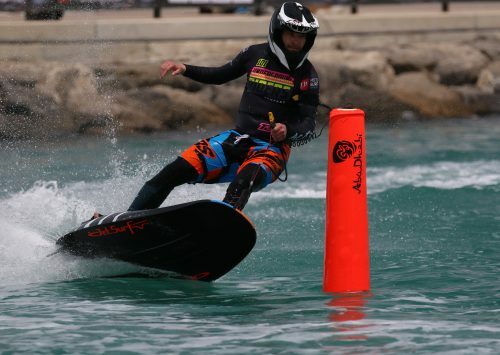 It was fantastic to see Luxury Water Toys‘ Flavien Neyertz back – the very first World Cup Champion who is ready to make racing come back after one season off. Rebel Surf UK came with a two members representation. Super experienced Steven Garner will be a great guide to Mohammed Abuelgasim who is heading into his first WorldCup full season and these two had some productive practice sessions together in Spain. Murat Yurgancilar didn’t miss an opportunity to ride with the World’s top guns. So did two new faces into the Championship, Tomáš Ševčík and Maylow Silver.